Arranged By [String] – Johnny Tate*, R.E.M. Their last good LP. They should have called it a day after Reveal. The break-through for R.E.M. came with the masterful trilogy Green (1988), Out Of Time (1991) and Automatic For The People (1992) as well as the hits Losing My Religion and Everybody Hurts. Apparently knew the formation around singer Michael Stipe not how they had to deal with the new status of superstar, because the hit one experimenting with hard guitars (on the cd sample) and electronics (Up). Musically speaking hit the Group at a dead end. 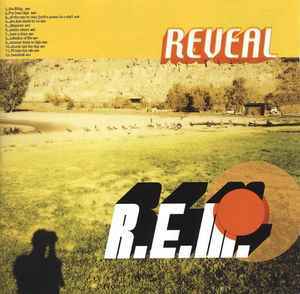 With Reveal R.E.M. proves on the way back. The power of the melody comes back in first place, whereby the experiment drift slightly to the background is ousted. The long-time fans will have to by biting at the gitaarvervormers and computers in The Lifting and R.E.M.-Saturn Return, but the familiar sound we hear back in the price numbers Beat A Drum and All The Way To Reno (you're Gonna Be A Star). The cheerful single Imitation Of Life has something away from Shiny Happy People, but just not too much. Other highlights are the two ballads I'll Take The Rain and Chorus And The Ring, which we hear Michael Stipe singing is getting better with the years.